With the addition of a new trim level for 2018. Honda just revealed the 2018 Fit and we get it, it's not exactly as exciting as the launch of a new Porsche. Just hear us out, because we think that this new Fit is much more important for the vast majority of people. In fact, we think that with the updates for 2018 Fit, Honda has built the perfect affordable car. So what's new for 2018? This refresh gives the Fit a more smooth look, unlike the 2017 model that looks a bit like an adolescent boy trying to fit into his father's suit. The Fit is now seriously handsome, and the new Sport trim makes it even better. The Sport trim is positioned below the mid-level EX trim and above the base LX trim. The Fit Sport comes with a more aggressive look with aero features in the front, sides and rear, a front and rear splitter, chrome exhaust tips and 16-inch black alloy wheels. 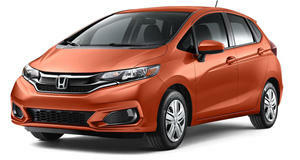 Honda also gave the Fit two new exciting colors, Helios Yellow Pearl (replacing Mystic Yellow) and Orange Fury. Everything that we loved about the 2017 Fit is still found on the 2018 model including the option for a slick, six-speed manual transmission. The Fit still retains its slightly underpowered 1.5-liter four-cylinder with 130 hp and 114 lb-ft of torque, but at least you can wring out every last bit of power without breaking any speed limits. The Fit is a great car for an enthusiast on a budget, but it lacks the fun that a Fiesta ST provides. The Fit does smoke the Fiesta in a few other areas though. The Fiesta's interior ergonomics pale in comparison to the Fit's. Not only do the Fit's rear seats fold flat (without removing the headrests like the Fiesta ST), the seat bottoms also fold up to create a flat floor for large items. It kills us to criticize the wonderful Fiesta ST, but in the subject of practicality, the Honda has the Ford beat. Where the Fit really starts to shine as the best affordable car on sale is in safety and convenience. For 2018, LX and Sport trim Fit models will have available Honda Sensing technology, which gives you a ton of features. Honda Sensing includes Adaptive Cruise Control, Collision Mitigation Brake Braking, Lane Keeping Assist with Lane Departure Warning and Road Departure Mitigation with Road Departure Warning. This means that the Honda Fit will be the most affordable car in America that offers such amazing safety features. This is a big deal for anyone who wants to get the most advanced car for their money. We are always surprised at the number of expensive cars that we see that don't even have keyless push-to-start and adaptive cruise control yet are triple the Fit's price. Honda has seriously blown us away with the 2018 Fit, and it is worth a look for anyone who wants a great new car on a budget. Pricing is unfortunately not available yet for the 2018 Fit, but expect a starting price of close to $16,000 with the top trim model capping out at about $20,000 and some change.